ALLED introduces this new product called LED Joinable Camping Light which is designed for your outdoors and vehicles, including interior and exterior opplication. Also you can use this light as a decoration to any places where the light needs. It's convenient for the camping needs or the boat general illumination application. The circuit board is absolutely sealed and waterproof feature. Very easy to dissipate the heat when the Aluminum housing designed allows .Equipped a light modulator which you can adjust the brightness according to your needs. The most important is that you don't have to worry about the lengthened to your demanded length with the connector. Because it is a flexible connector to your needs, to have a wonderful and special camping trip our company has design this kind of light especially for your convenience. It's very easy for you to take with a light and handy bag. For the LED strip light, its operating voltage for 12V DC, super bright and high quality 5050 LED chips, Easy to install in any places where you needed. Besides this you can also choose the brightness level from Weak to strong, it fits your fancy .So you also can use it in any kinds of your need. To test the light quality, brightness, features and installation, our group went a forest had a test according to the situation where and when you go camping. 2. The LED Joinable Strip Light accessories. The LED Waterproof Connectable Strip Camping Light is equip with a dimmer switch, two and three kinds of sections splitter cables with quick connectors, 10M, 2.5M, 1.2M cable with quick connects, 3M quick connect cable with cigarette attachment, a battery terminal clamps to cigarette adaptor, Zip-ties for, Velcro wraps, clips, if you only buy one light. But all these accessories can be add more it is according to your needs about how many lights you want to buy. 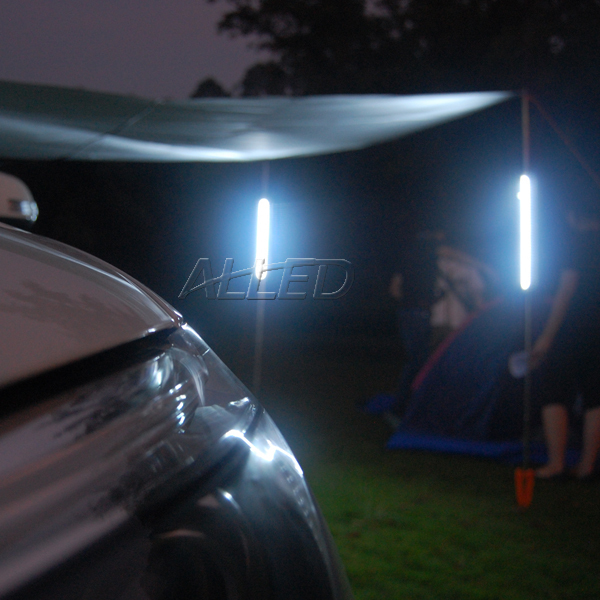 LED Waterproof Connectable Strip Camping Light is especially to install while you are driving on camping trip. For installation If you choose one to four 500mm strip lights connect together with Double or three sections splitter cables,10M,2.5M,1.2quick connect cable by using Zip-ties, Velcro wraps, clips to fix, It is changeable and flexible to add as many as you like. Firstly a dimmer switch is to adjust your brightness level from weak to strong per your wish. For your flexible power you can use cigarette connector and battery terminal clamp to charge solutions, in car there is a electricity contact ,all you have to do is connect the Battery terminal clamps to cigarette adaptor together to get power. It is long enough for you to reach your car distance. Easy to install, all you have to do is put lights with connect cable together. Warmly Remark: the dimmer is not waterproof, not to exposure it in rainy environment. 4．Usage of mounting to tie the light up. 5. The usage of strip lights. As you know the 500mm camping strip lights can be connected, so various application for you to use as a camping light to install in front of your camp house, three or four lights together can be a decoration view on the camping house, also to decorate on the trees to bring light with durable usage. For outdoor you can use to watch your way and meetings. With the lights you can dance, singing, playing game, talking with friends or family. Even you can use it as art background. Many imaginations you can think about it. The most important is that it is designed with high quality and brightness light. Idea for using on the boat . Everybody is dreaming to have a special and wonderful camping trip, for adventure, family or friends meetings, exploring the nature of the world just to relax and feeling the quiet moment while birds are singing, full of nature and flowers ragrance around you. Have a special night in piece. The advantages of changeable accessories and 500mm strip lights with easy installation and take, to have a convenient and wonderful camping trip you deserve to have.